As we approached our fifth release, we decided it’d be nice to do something a wee bitty special and get some remixes done. 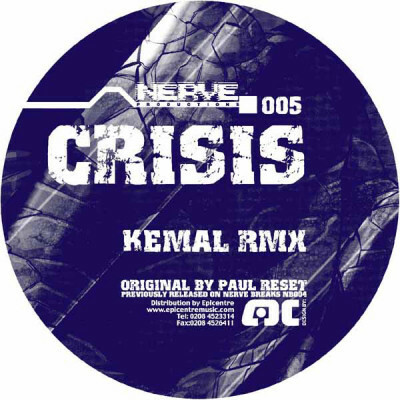 Kemal was a friend from around the dnb scene in Glasgow (he gave me my first proper gig and we also worked on a track called Kontempt for Underfire) so I asked if he fancied taking on one of my breaks tunes. I met him for a coffee and gave him the parts to “Crisis” (originally released on NB004) and within a couple of days – he’d finished it, the man was a genius in the studio The track was and probably still is the biggest track we’ve ever released – everyone was playing it – from Andy C to Marcus Intalex and everyone inbetween. The release did well – but just after it came out our distributor at the time (Epicentre) went under, so I have no real idea how it sold other than “well”. For the flip, we recruited rising stars Black Sun Empire. 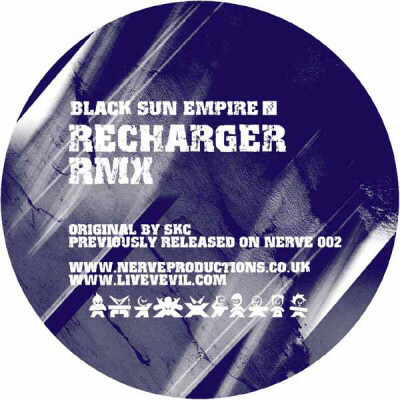 They’d been releasing some absolutely amazing tunes and we were keen to see what they’d do to SKC’s “Recharger” (from NERVE002). They turned in a brilliant remix which upped the dancefloor factor of the original and added their own very unique BSE touches. huge. thanks much Nerve crew!! Crisis is one of the best i have ever heard. I rly believe that Kemal will back and make a new stuff in the future. Ppl defo waiting. Greets to you Paul. Cheers for these Paul. I had never heard the BSE remix so its great to get my mind blown what… years on? Thanks Paul. Nice looking at your discography and reading all the artist comments too! This is such a tune & sorry to hear you never knew the true sales figures.